Stroke. 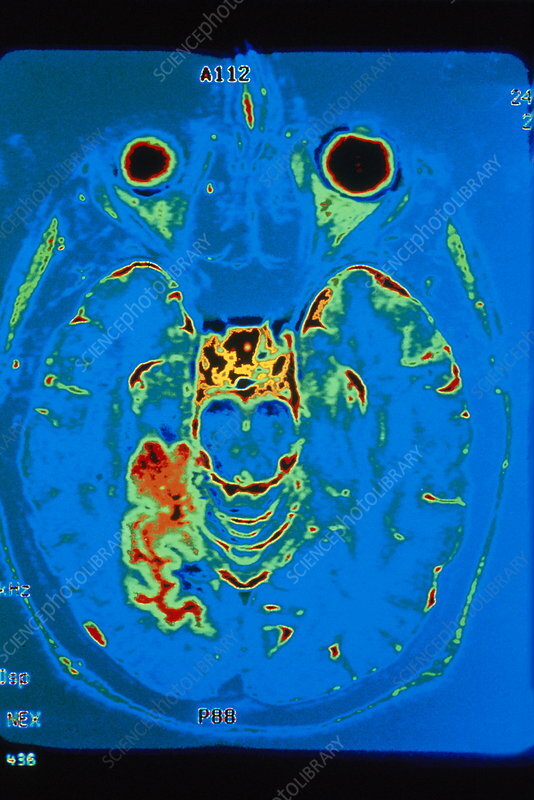 Coloured magnetic resonance imaging (MRI) scan of a brain showing a stroke (red, lower left), an area of abnormal bleeding (haemorrhage) in the brain. The front of the brain is at top. The bleeding usually results from a ruptured blood vessel. The areas of the brain supplied with blood by this vessel are thus starved of oxygen, and die. The symptoms of this depend on what part of the brain is affected. Some strokes are instantly fatal, while others may pass unnoticed. In many cases the symptoms only affect half of the body, as each half is controlled by half the brain. Typical symptoms include loss of muscle tone, paralysis and memory problems.